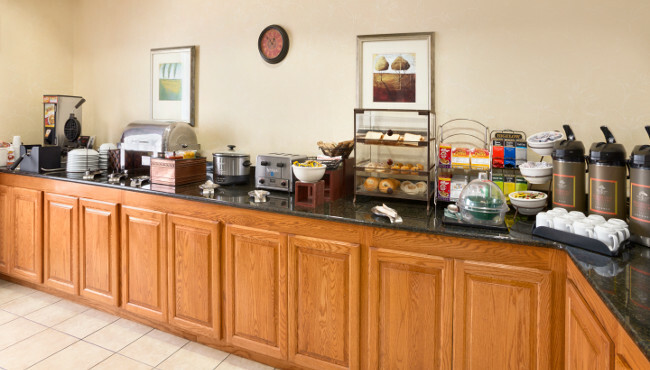 At the Country Inn & Suites, Albany, GA, our free, hot breakfast features all your favorites to start the morning off right. Follow the aroma of freshly brewed Highridge Country ReserveTM coffee to our cheerful hotel dining area for waffles, bagels, cereals and pastries. We rotate hot items daily so you don’t have to eat the same meal twice. When it’s time for lunch or dinner, head to one of Albany’s best local restaurants like Pearly's Famous Country Cooking or AJ's Seafood and Oyster Bar. Sat-Sun, 6:00 a.m. - 10:00 a.m.